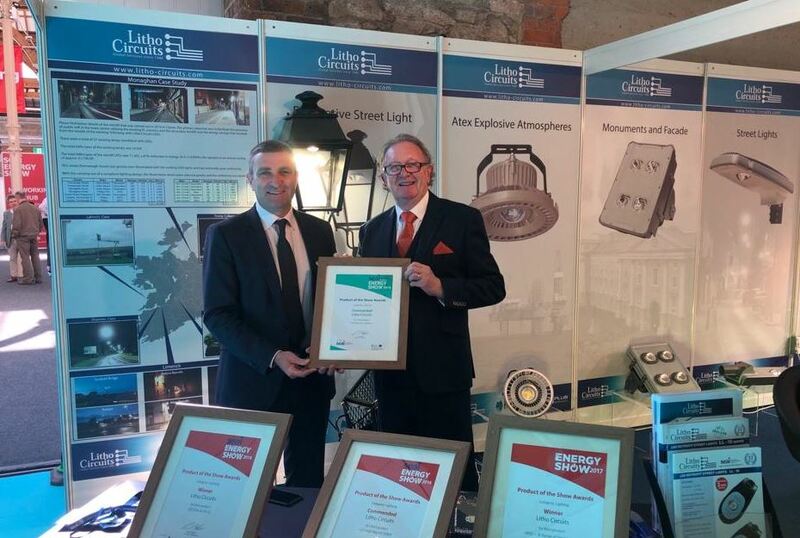 The Management and Staff at Litho Circuits took great pride in accepting commendation for, The Shannon Lantern, at the SEAI Energy Show 2019 in the RDS, Dublin. Since 2017 recognition for our ambition to create a sustainable lighting solution for the future has been acknowledged at the SEAI Energy Shows winning in the Lighting Category with the MicroPlus Street Light (2017), SOX20-28-32W LED Bulb (2018) and winning Commendation for Driver on-board Warehouse Light – LED High Bay UF150DR (2018) as well as commendation again in 2019 for The Shannon Lantern. The Shannon LED Lantern, manufactured in Ireland, by Harte Outdoor Lighting offers a cost effective, energy saving lighting solution. The gear tray, supplied by Litho-Circuits (SEAI/TripleE Approved) has been used to retrofit lights throughout Ireland in housing such as WRTL, Albany and DW Windsor Lanterns. Some of our work is seen in Limerick City and County, Clare, Monaghan, Cavan, Donegal and the prestigious Trinity College Dublin. This gear tray incorporates the latest Microled Plus Technology which can achieve 150/160 LM/W, 2,700K giving up to 75% savings over traditional lighting solutions. The Shannon Lantern comes with optic systems including high purity glass lenses -96% and low absorption (less than 5%). The lenses generate different geometric forms when scattering light beams emitted by the Microled Plus device, providing symmetric and asymmetric distribution of different angles and planes. Over the past number of years, we received a lot of enquiries from clients who wanted to upgrade their lighting systems but keep the old housing; which in many cases was over 100 years old and had naturally become damaged through wear and tear. We wanted to be able to assist in these projects so that our clients could achieve their goals. We worked to create our own retrofit lights using the latest Microplus energy saving technology which greatly reduces energy costs. We are now able to accommodate clients who are keen to keep their old housing and still achieve Energy Saving targets while reducing their environmental impact. An excellent example of where the Shannon Lantern was used is in Trinity College Dublin. We were approached by the university with a requirement to replace a significant number of very old gas lights and to retain the nice warm glow from a 2,700k colour temperature; not increasing it to a standard 4,000k white light. We were required to retrofit the lights so that modern LED energy saving lights would fit into the housing. Litho Circuits achieved the optimum results for Trinity College and they have now placed an order to continue with these retrofits throughout the remainder of the campus. Litho Circuits were commissioned by Limerick City Council to retrofit the Old-Style Lanterns on Sarsfield Bridge Limerick City and achieving Energy Savings of over 70% and retaining the 2,700K colour temperature. The above are some of the projects undertaken by Litho Circuits, If you are interested in upgrading your old lighting, we would be delighted to assist no matter how big or small the projects may be. Please do not hesitate to get in contact with our design team who would be happy to advise on the best solution for your lighting requirements.